Joy Hernandez is an artist currently residing in Indianapolis, Indiana. The artistic thread runs through many members of her family and she is proud to carry on that tradition. She was good at coloring “in the lines” at an early age, and has been painting or drawing ever since. She was born in Kewanee, Illinois, and spent most of her childhood there. 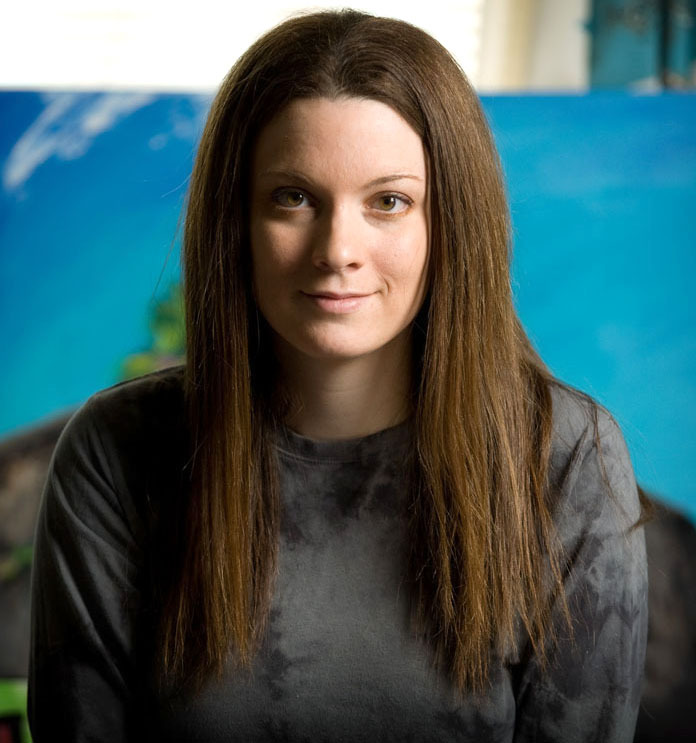 She received wonderful instruction during high school in the techniques of watercolor, pastel and acrylic painting and was placed in leadership roles by her art teacher, Mrs. Sue Blake, for school dance decoration and school theatre set designs. Joy won multiple awards in various high school competitions, including gold keys at the Scholastic Art and Writing Competition and several places at the Congressional Art Competition. 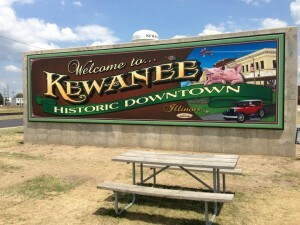 Joy has carried with her the local flavor and traditions of life in Kewanee, and this influence can be seen in some of her work today. Wanting to pursue a career in animation, Joy enrolled at the Illinois Institute of Art in Chicago, but decided the slower pace of animation work was not best for her, although an appreciation for animated works remained. She then moved to Indianapolis to study television news photography at the University of Indianapolis. While there, she continued to advance her artistic skills, training her eye and exercising her creative spirit by working in television news. Currently, Joy is a video photographer and editor at WISH-TV, the CW affiliate in Indianapolis and also a reporter-photographer for the nationally-syndicated show Pet Pals TV. She views this line of work to be just one more outlet for artistic creativity. The images she sees on some of her story assignments have worked their way into her paintings and drawings. Joy has also become more focused on showing her artwork in her community, starting with her first gallery experience at Art & Soul by Phoebe Gallery in Muncie, Indiana. Her first solo show was at the Clowes Memorial Hall performing arts venue on the campus of Butler University. For five years, Joy was the gallery manager at the Art Bank, in Indianapolis, and showed her work there regularly. Also in 2013, Joy got an opportunity to join the Walldogs mural organization, when they picked her hometown of Kewanee, Illinois, for their annual meet. She helped with promotion and organization of the event, and then had the honor of helping to paint one of the 15 historically-based murals created during the five days of the meet. 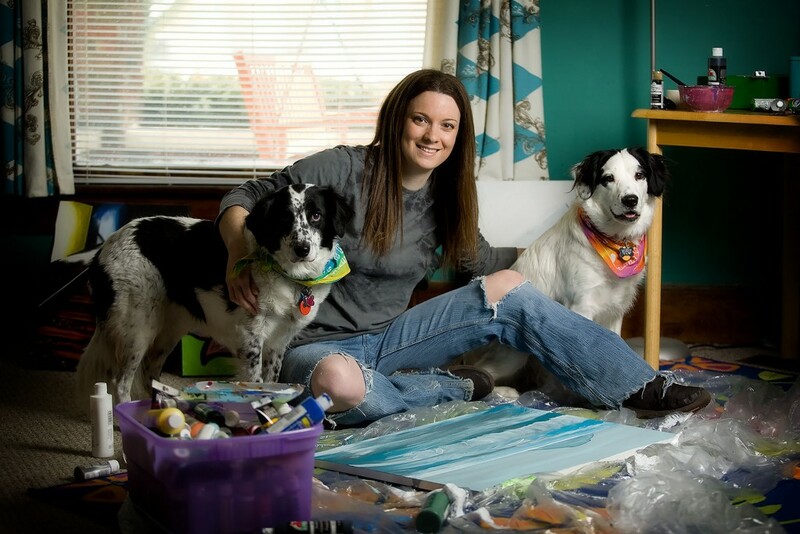 Joy has since traveled with the Walldogs to their meets in Shipshewana, Indiana, and Marshall, Illinois, as well as assisted on a mural in Union City, Indiana. She continues to look forward to the annual meets and any additional opportunities to assist her Walldog friends in their projects. She has also turned her promotional skills toward Kewanee, helping the town to win the title of Most Friendliest Small Town in the 2013 Rand McNally Best of the Road contest, and shooting the town’s 2014 viral video version of Pharrell William’s “Happy” song, which was featured on CNN’s 50 States 50 Stories for Illinois. In 2017, Joy left the Art Bank to found the Full Circle Nine Gallery, in the Circle City Industrial Complex, near downtown Indianapolis, with several artist friends. Transforming part of an old car factory into a usable gallery space, and starting a business from the ground up, taught Joy many lessons, and brought many in the group “full circle” in the business side of art. Joy regularly shows her work at FC9 and considers it her gallery home. Joy continues to show at the Full Circle Nine Gallery, as well as other locations and show opportunities throughout Indianapolis. Her current painting focus is around a stenciling technique with a mix of aerosol and acrylic underlay showcasing her quirky interests. She also happily accepts commissions dealing in personal subject matter as requested by her fans and patrons. “Cue the obligatory artist’s paragraph describing how I’ve been creating art as long as I can remember. But really, I grew up surrounded by good people encouraging me to be creative and do my own thing. Arts and crafts, marching to my own drum, parents, grandparents, and art teachers—Kewanee, Illinois was a great place for me. At Kewanee High School, I was entrusted with several responsibilities in the art class room. I lead teams of students creating several murals on paper for our school dance decorations, I helped gather pieces for entry into regional shows, and I even helped teach freshman in Art 1 while our teacher was pulled away to advise building renovations. 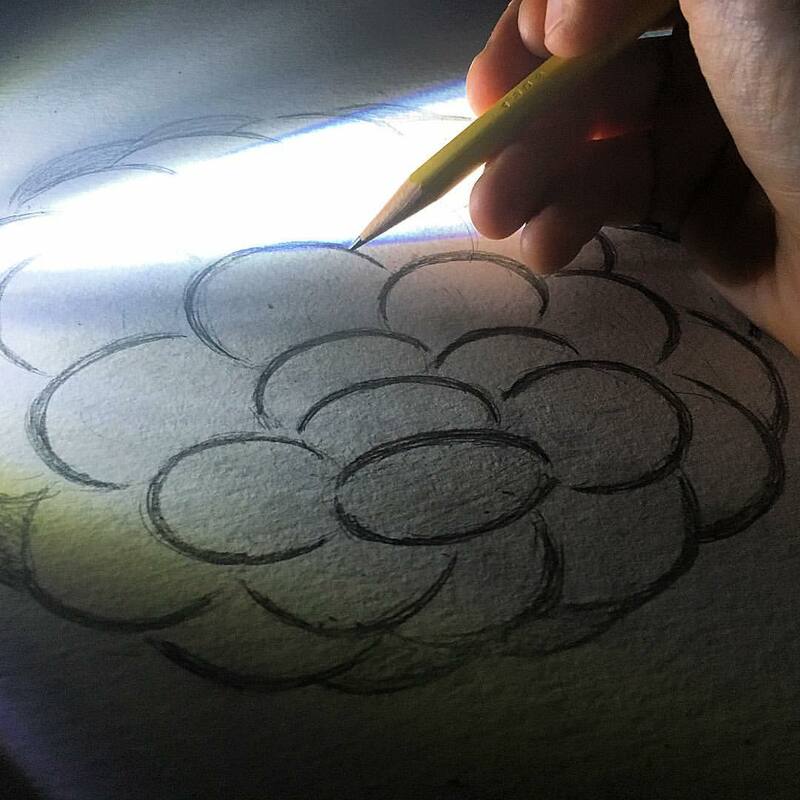 Responsibility and trust can go a long way with a student, and while I learned the tools of the art trade in class, responsibility and trust were the real lessons I took with me. I attended the Illinois Institute of Art, starting in 2000, with the goal of a career in animation. The Lion King blew my mind as a kid, and I loved the idea of creating stories and rendering them so others could see what I see. Unfortunately, my attention span is short, and 500 drawings for a 30 second cartoon quickly taught me that that was not a career path I should follow. Lessons stuck with me, though, and helped to shape my art as it is today. I moved to Indianapolis in 2002, to study communication, and, especially, journalism. By becoming a news photographer, I could push a button, count to 30, and have 30 seconds of video without drawing 500 pictures. As a lifelong student of history and current events, video work was a perfect match. And, the story changes every day, perfect for a short attention span. While art has influenced my video work in many ways, it took a back seat for a few years as I recovered from the animation burn-out. I drew political cartoons in college, some winning awards from the Society of Professional Journalists, but I focused more on composition and framing, and applying that to my video work. I love my career and think of it as its own art form. But I had to draw again. You can take the artist out of the cartoons, but you can’t take the cartoons out of the artist. Or, at least in my case, that’s true. I returned to painting in 2007, and, by 2010, I got my nerve up enough to begin showing in local galleries. My first gallery experience was at Art and Soul by Phoebe, a gallery in Muncie, Indiana. It was a great environment, encouraging a young artist and helping to build self-esteem. “I am good enough to show my art!” I made lifelong friends that taught me that and put it in my core. I joined the Art Bank in 2011 and became the gallery manager in 2013, under the encouragement of gallery owner Dan Haynes. The lessons of responsibility and trust from high school paid off, we had success, and I made more lifelong friends. It’s always good to be surrounded by artists in a creative environment—you can only push each other and inspire each other to great ends. In 2015, I was named the president of the Indianapolis Downtown Artists and Dealers Association (IDADA). We work to create a strong voice, together, for Indianapolis artists. I’m grateful for the opportunity, but still amazed that I’m in that role. This isn’t some notion of false humility, a put-on; I’m truly amazed of the work of others before me, and can only hope to leave the organization in the best possible place, when my term is up, to best carry on the legacy they built. But truly, this is what I get for asking too many questions during public board meetings. In late 2016, a group of my artist friends and I decided it was time for a change. We wanted to step up to the next level, to found our own gallery, and to complete missing pieces in our knowledge of the business aspects of art. We wanted to create our own thing on our own terms. We got to it, and, within two months, the Full Circle Nine Gallery held its grand opening. I have no regrets–it was a lot of work, but one of the most fulfilling adventures I’ve ever had. I’m now the founder and president of a gallery, and it’s occupied by friends and filled with laughter, and we continue to push each other and grow together.